Herman Hollerith (February 29, 1860 – November 17, 1929) was an American inventor who developed an electromechanical punched card tabulator to assist in summarizing information and, later, accounting. He was the founder of the Tabulating Machine Company that was amalgamated (via stock acquisition) in 1911 with three other companies to form a fifth company, the Computing-Tabulating-Recording Company, which was renamed IBM in 1924. Hollerith is regarded as one of the seminal figures in the development of data processing. His invention of the punched card tabulating machine marks the beginning of the era of semiautomatic data processing systems, and his concept dominated that landscape for nearly a century. Herman Hollerith was born the son of German immigrant Prof. Georg Hollerith from Großfischlingen (near Neustadt an der Weinstraße) in Buffalo, New York, where he spent his early childhood. He entered the City College of New York in 1875, graduated from the Columbia University School of Mines with an "Engineer of Mines" degree in 1879 at age 19, and in 1890 asked for (and was awarded) a Ph.D based on his development of the tabulating system. In 1882 Hollerith joined the Massachusetts Institute of Technology where he taught mechanical engineering and conducted his first experiments with punched cards. He eventually moved to Washington, D.C., living in Georgetown, with a home on 29th Street and a business building at 31st Street and the C&O Canal, where today there is a commemorative plaque installed by IBM. He died in Washington D.C. of a heart attack. Replica of Hollerith tabulating machine with sorting box, circa 1890. The "sorting box" was an adjunct to, and controlled by, the tabulator. The "sorter", an independent machine, was a later development. The herein-described method of compiling statistics, which consists in recording separate statistical items pertaining to the individual by holes or combinations of holes punched in sheets of electrically non-conducting material, and bearing a specific relation to each other and to a standard, and then counting or tallying such statistical items separately or in combination by means of mechanical counters operated by electro-magnets the circuits through which are controlled by the perforated sheets, substantially as and for the purpose set forth. Hollerith's grave at Oak Hill Cemetery in Georgetown in Washington, D.C.
Hollerith had left teaching and begun working for the United States Census Bureau in the year he filed his first patent application. Titled "Art of Compiling Statistics", it was filed on September 23, 1884; U.S. Patent 395,782 was granted on January 8, 1889. Hollerith initially did business under his own name, as The Hollerith Electric Tabulating System, specializing in punched card data processing equipment. He provided tabulators and other machines under contract for the Census Office, which used them for the 1890 census. The net effect of the many changes from the 1880 census: the larger population, the data items to be collected, the Census Bureau headcount, the scheduled publications, and the use of Hollerith's electromechanical tabulators, was to reduce the time required to process the census from eight years for the 1880 census to six years for the 1890 census. In 1896 Hollerith founded the Tabulating Machine Company (in 1905 renamed The Tabulating Machine Company). Many major census bureaus around the world leased his equipment and purchased his cards, as did major insurance companies. Hollerith's machines were used for censuses in England, Italy, Germany, Russia, Austria, Canada, France, Norway, Puerto Rico, Cuba, and the Philippines, and again in the 1900 census. He invented the first automatic card-feed mechanism and the first keypunch. The 1890 Tabulator was hardwired to operate on 1890 Census cards. A control panel in his 1906 Type I Tabulator simplified rewiring for different jobs. The 1920s removable control panel supported prewiring and near instant job changing. These inventions were among the foundations of the data processing industry and Hollerith's punched cards (later used for computer input/output) continued in use for almost a century. In 1911 four corporations, including Hollerith's firm, were amalgamated to form a fifth company, the Computing-Tabulating-Recording Company (CTR). Under the presidency of Thomas J. Watson, CTR was renamed International Business Machines Corporation (IBM) in 1924. By 1933 The Tabulating Machine Company name had disappeared as subsidiary companies were subsumed by IBM. Hollerith is buried at Oak Hill Cemetery in the Georgetown neighborhood of Washington, D.C.
His great-grandson, the Rt. Rev. Herman Hollerith IV, was the Episcopal bishop of the Diocese of Southern Virginia, and another great-grandson, Randolph Marshall Hollerith, is an Episcopal priest and the dean of Washington National Cathedral in Washington, D.C.
^ Cambell-Kelly, Martin; Aspray, William (2004). Computer: A History of the Information Machine (2ND ed.). Basic Books. p. 16. ^ a b c Da Cruz, Frank (March 28, 2011). "Herman Hollerith". www.columbia.edu. Columbia University. Retrieved February 28, 2014. ^ Brooks, Frederick P.; Iverson, Kenneth E. (1963). Automatic Data Processing. Wiley. p. 94 "semiautomatic". ^ "Herman Hollerith (1860-1929)". www.hnf.de. AUPaderborn: Heinz Nixdorf MuseumsForum. April 18, 2012. Retrieved February 28, 2014. ^ Austrian 1982, p. 56. ^ a b O'Connor, J. J.; Robertson, E. F. "Herman Hollerith". The MacTutor History of Mathematics Archive. School of Mathematics and Statistics, University of St Andrews, Scotland. Retrieved March 5, 2013. ^ Lydenberg, Harry Miller (1924). John Shaw Billings: Creator of the National Medical Library and its Catalogue, First Director of the New York Public Library. American Library Association. p. 32. ^ Randell, Brian, ed. (1982). The Origins of Digital Computers, Selected Papers (3rd ed.). Springer-Verlag. ISBN 0-387-11319-3. ^ Truesdell 1965, p. 144. ^ Austrian 1982, pp. 178-179. ^ a b "Oak Hill Cemetery Map". www.oakhillcemeterydc.org. Retrieved January 8, 2018. ^ Austrian 1982, p. 153. ^ Report of the Commissioner of Labor In Charge of The Eleventh Census to the Secretary of the Interior for the Fiscal Year Ending June 30, 1895 Washington, D.C., July 29, 1895 Page 9: "You may confidently look for the rapid reduction of the force of this office after the 1st of October, and the entire cessation of clerical work during the present calendar year. ... The condition of the work of the Census Division and the condition of the final reports show clearly that the work of the Eleventh Census will be completed at least two years earlier than was the work of the Tenth Census." Carroll D. Wright Commissioner of Labor in Charge. ^ Engelbourg 1954, p. 52. ^ Mackenzie, Charles E. (1980). Coded Character Sets, History and Development. The Systems Programming Series (1 ed.). Addison-Wesley Publishing Company, Inc. p. 7. ISBN 0-201-14460-3. LCCN 77-90165. ^ "IBM Archives: Frequently Asked Questions" (PDF). Some accounts of the forming CTR state that only three corporations were included. This reference notes that only three of the four corporations are represented in the CTR name. That may be the reason for the differing accounts. ^ William Rodgers (1969). THINK: A Biography of the Watsons and IBM. p. 83. ^ American Standard FORTRAN. American Standards Association, X3.9-1966. pp. 9, 10. "4.2.6 Hollerith Type. A Hollerith datum is a string of characters. This string may consist of any characters capable of representation in the processor. The blank character is a valid and significant character in a Hollerith datum." ^ Steven G. Vegh (February 13, 2009). "New Epsicopal bishop to face tough challenges". Virginian-Pilot. ^ "Virginia diocese to install bishop". Richmond Times-Dispatch. Austrian, Geoffrey D. (1982). Herman Hollerith: The Forgotten Giant of Information Processing. Columbia University Press. p. 418. ISBN 0-231-05146-8. Truesdell, Leon E. (1965). 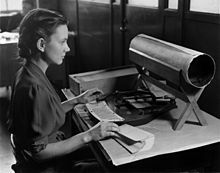 The Development of Punch Card Tabulation in the Bureau of the Census 1890-1940. US GPO. Includes extensive, detailed, description of Hollerith's first machines and their use for the 1890 census. Ashurst, Gareth (1983). Pioneers of Computing. Frederick Muller. pp. 77–90. Cortada, James W. (1993). Before the Computer: IBM, NCR, Burroughs, & Remington Rand & the Industry they created, 1865 - 1956. Princeton. p. 344. ISBN 0-691-04807-X. Essinger, James (2004). Jacquard's Web: How a Hand-Loom Led to the Birth of the Information Age. Oxford: Oxford University Press. Engelbourg, Saul (1954). International Business Machines: A Business History (Ph.D.). Columbia University. p. 385. Reprinted by Arno Press, 1976, from the best available copy. Some text is illegible. Heide, Lars. "Herman Hollerith". In Jeffrey Fear (ed.). Immigrant Entrepreneurship: German-American Business Biographies, 1720 to the Present. German Historical Institute, 2017. Heide, Lars (2009). Punched-Card Systems and the Early Information Explosion, 1880-1945. Johns Hopkins. ISBN 0-8018-9143-4. Hollerith, Herman (April 1889). "An Electric Tabulating System". The Quarterly, Columbia University School of Mines. X (16): 238–255. From the Columbia Univ. History site: This article is the basis for his 1890 Columbia Ph.D. Extracts reprinted in (Randell, 1982). Hollerith, Herman (1890). In connection with the electric tabulation system which has been adopted by U.S. government for the work of the census bureau. Ph.D. dissertation. Columbia University School of Mines. Hollerith, Herman (December 1894). "The Electrical Tabulating Machine". Journal of the Royal Statistical Society. Blackwell Publishing. 57 (4): 678–682. doi:10.2307/2979610. JSTOR 2979610. From Randell (1982),"... brief... fascinating article... describes the way in which tabulators and sorters were used on ... 100 million cards ... 1890 census." Wikimedia Commons has media related to Herman Hollerith. Herman Hollerith (2017) In Immigrant Entrepreneurship Recommended. O'Connor, John J.; Robertson, Edmund F., "Herman Hollerith", MacTutor History of Mathematics archive, University of St Andrews . The Norwegian Historical Data Center: Census 1900 Includes a description of the use of Hollerith machines ("complicated, American enumeration machines"), together with illustrations. The Research notes on Herman Hollerith collection at Hagley Museum and Library includes the research materials Geoffrey Austrian used to write Herman Hollerith: Forgotten Giant of Information Processing. Richard Hollerith Papers at Hagley Museum and Library. Richard Hollerith was the grandson of Herman Hollerith and part of this collection documents the sale and settlement of the Herman Hollerith estate following the death of his last remaining child, Virginia.